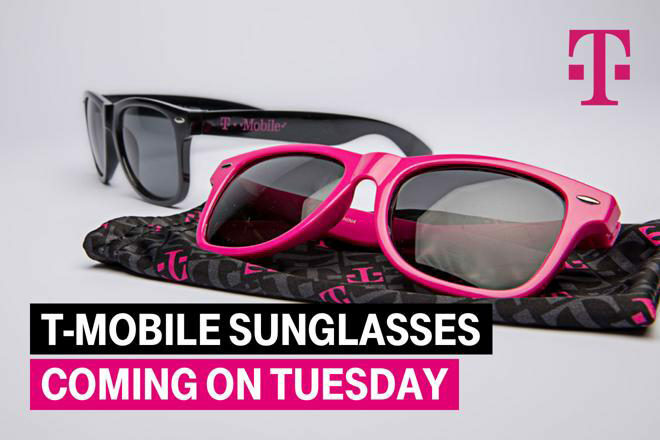 The gifts for next week’s T-Mobile Tuesday have been revealed, and they include another T-Mo-branded accessory. On June 19th, T-Mobile customers can score a free pair of T-Mo sunglasses, just in time for summer. The image shared by T-Mobile shows both black and magenta-colored pairs with “T-Mobile” printed on the side. Also coming next week is a $2 promo card for ice cream from Baskin-Robbins, savings on gas at Shell, and 20 free 4×6 photo prints plus free shipping from Snapfish. And like every other Tuesday in June, T-Mobile customers can get a $2 SD movie rental from Vudu next week, too. There will not be any prizes next week. Yeah, a lot of the schwag is cheap trade show quality trinkets, and the garish TM T-mo Pink does have some value for white elephant gag gifts, (did score a Tmo superhero halloween cape/loincloth lol ). While I understand economy of mass marketed goods for the T-mo Tues and it written off as advertising. I might have used a Tmo umbrella in a pinch before living in Portland 20+ years. In some ways I think that they might be ahead of the game by tasteful branding or color accents for useful quality goods that people would/will use, i.e. a tasteful branded otterbox with new S9/iPX or choice of case or a black and T-mo pink UE Wonderboom BT speaker, or high quality wireless charging pad or nylon braided charging cables (USB-C/lightning with wall/car charger OEM). While it might be a no-go for apple products and purist. But I think that T-mo branded Popsockects would actually get used and seen even in the garish pink, I think that it could be a win for T-mo Tuesdays and I think people would even pay/allow to have .99 shipping added to thier monthly bill (no wasted trips to stores). I’ve never had much of an issue in store. If you go late in the day they will run out no doubt. I’ve never gone there later than 12 noon. Of course the fact that I’m in NYC where population density is a big factor probably has something to do with it also. Just makes me agree with Yonatan and his idea of shipping these ‘very limited supply’ items for a small fee seem absolutely reasonable. Got to the point last time I was so annoyed i told them I was gonna wait outside before they open to be the first one in store to see how they’d claim to have ‘given it’ all out already. Actually, probably being in New York, where being an obnoxious jerk is looked upon as being a strong point, has more to do with it. Actually, probably not being from New York, where being pretentious and disingenuous is looked upon as being a strong point, is the explanation for that ignorant, imbecilic comment you just posted. I call the store before going every time to be sure the freebie is there and kind of give them a heads up I’m on the way. When I walk in they have the item ready and don’t have to dig it out because they’ve previously located it. 1 minute tops, I’ve sometimes been given extra because no one had gone in (Panini stickers). Yeah I get an attitude from the guy every time I go in there, the manager has no issues with it. Eh, I’ll grab those sunglasses. My daughter just got her first phone and would love those sunglasses. I’ll give my pair to my 9 year old son. I need a pair of sunglasses, but I’ll opt for something with a better build and polarized lenses that isn’t super expensive (any suggestions? Looking for brown lenses). Woot dot com (can’t recall if links are blocked here) usually has sales on Oakley Ray Ban, etc. Unfortunately/fortunately links have to be mod approved before posts will be shown. I do love free stuff!! At least the fuel is back. Last week was weak IMO. Yeah, not as lame as two weeks ago though. AGAIN, it isn’t a “free $2 VUDU rental”, it’s $3.50 VUDU credit that can be used for renting, buying, and disc to digital. They really need to do magenta T-Mobile cases for these Tuesdays. Just some TPU or silicone ones. Add a little protection for the user and for trade-ins/ups, show a little advertisement, and make a lot of users happy. Win-win-win. Was there at 10am and got the black framed sun glasses. They fit good and worked well enough.